Prospective franchisees often begin their journey at Discovery Day events -- but not everyone makes the cut. 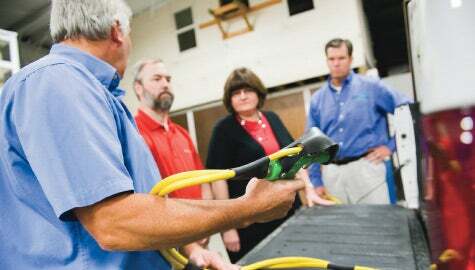 Getting a handle: Bob and Kathy Summers, center, tour Green-Spring Lawn Care Corp. with president James Young, far right. 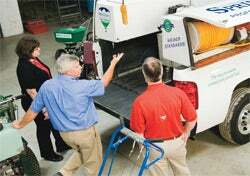 Bob and Kathy Summers recently stood in a warehouse in Illinois and met their future: an extended cab truck, a rolling fertilizer spreader and a backpack pest control sprayer that can squirt high up into afflicted trees. The Summerses, who live in Cary, N.C., were attending Join the Team Day at Spring-Green Lawn Care Corp.--878 miles away in Plainfield--and had spent the morning listening to presentations by franchise executives on everything from marketing campaigns to grub control. They'd met a key executive and talked about how much revenue an average franchisee brings in after one year. After lunch with the staff, the couple toured a nearby Spring-Green corporate operation and examined the kinds of equipment they'd need to tend to lawns and trees themselves. The experience made an impact. Once home, the Summerses decided to go ahead and purchase an existing Spring-Green franchise. "I had a pretty good impression of the company before we went out there, but [the visit] reinforced my idea that they are an enthusiastic and honest group of people," Bob says. "Before we went, I thought Bob was nuts to be considering this," Kathy says. "He doesn't even take care of his own lawn. Now I can see that the business is a lot more sophisticated than I expected." If you're looking into franchises, you, too, may be invited to some type of corporate visit--traditionally called Discovery Days because, before the Internet, prospective franchisees used them to "discover" who ran a franchise company and what products or services the company offered. Things are different today. "Discovery is more front-loaded," says James Young, president of Spring-Green. Potential franchisees like the Summerses can watch online videos about a franchise company from home and even "meet" executives face-to-face via videoconferencing. About half of attendees at old-style Discovery Days became franchisees, Young says, but he expects about90 percent of "Join the Team" attendees to sign on with Spring-Green, which has 127 locations in 26 states. "More franchisors are using technology to engage people today, so candidates tend to know more and be more committed when they travel to corporate headquarters," says Jeff Sturgis, president of Franchise System Advisors in Boston. "Discovery Day has moved further into the sales process and now tends to be more of a validation day." Of course, prospective franchisees still make some discoveries. Ted Dowdell of Columbus, Ohio, says it was a Meet the Team Day tour of TSS Photography's production facilities in Duluth, Ga., that persuaded him to buy a franchise. That's where about 75 employees process 2 million photos of school groups and young soccer, baseball and football players each year. "They walked us through the production side and it was working like a machine," Dowdell says. "I realized why they have such a high success rate, and why they always ship the right product at the right time. If I hadn't seen that, I'm not sure I would have joined the franchise." Sometimes, a visit to headquarters might have the opposite effect. For instance, Sturgis says, a prospective franchisee might decide not to join a franchise if its office is in disarray. Sturgis says other red flags include hearing information that is inconsistent with what your franchise salesperson has been telling you; having executives dodge your questions; or being pressured to buy a franchise on the spot. Before going to Spring-Green, the Summerses had attended a Discovery Day for an auto repair concept and the experience had turned them off to that franchise. "It was a smaller operation, and their corporate staff had to be jacks-of-all-trades," Kathy says. "Each person was so critical, we wondered how they'd handle it if they lost one of them." But Discovery goes both ways, and some attendees don't join the team not because they choose not to but because they don't make the cut. While franchise executives are giving PowerPoint presentations and talking about franchisee support, they're also assessing potential franchisees. "We watch what questions they're asking," Young says. "If the same issues keep coming up, after we feel we've answered them, we start to worry." Other franchise executives, such as Shelly Sun, CEO and co-founder of BrightStar Care in Gurnee, Ill., begin watching franchise candidates during a welcome dinner the night before Join the Team Day even begins. Candidates who drink too much are promptly sent home. "How can someone take care of seniors or children if they can't control their drinking?" she says. "We also drop people who have a very arrogant interaction with the waitstaff, because it shows they won't be respectful to their caregivers either. And about six months ago, we uninvited a woman who said she was interested in our concept even though she finds old people annoying." We asked several franchisors what they're looking for during Discovery Day events and talked to new franchisees about what they learned there. For starters, accept invitations only from franchise systems that really interest you and those you've researched. Even if the franchisor offers to pick up part of the tab, flying to a distant city to attend a Discovery Day is expensive and you don't want to waste anyone's time. Talk to as many franchisees who are already in the system as you can so that you can home in on what's important to you during your visit, advises Joseph Schumacher, president and CEO of Goddard Systems Inc., the franchisor of Goddard Schools, early childhood education centers, based in King of Prussia, Penn. As with any job interview, it's better that you overdress. "Dress professionally," Sturgis says. "First impressions are important." If you're invited to dinner or lunch at a restaurant with franchise executives, keep in mind that it is not a social engagement. Listen to what they're saying and don't offer personal information unless asked, says David Jones of Corona, Calif., who recently purchased BrightStar franchises in the California cities of Redlands and Riverside. Get your partner on board early, says Scott Colabuono, CEO of Fantastic Sams, a hair salon franchise based in Beverly, Mass. Even if you plan to run the franchise by yourself, franchisors want to know that your spouse or partner is supportive. "I was recently in Dallas at a meeting with a well-qualified couple, but at the dinner table they contradicted each other about who was putting off making the decision to purchase the franchise," he says. "They eliminated themselves right there." Show that you can follow directions and make up your mind. The ability to follow a system is so important for franchisees of Wireless Zone, a mobile phone retailer based in Middletown, Conn., that Sean Fitzgerald, national vice president of franchise development, has built it into the Discovery Day agenda. "We reject people who want to jump around in the process," he says. "While we want people with outgoing personalities, we turn down people who come off as pushy." Spring-Green's Young says: "We monitor candidates even before they come to Join the Team Day to determine how decisive and cooperative they are. How responsive are they when we ask them to do something, like shop their competitors? Did they read the book we sent them for background information? Did they fill out their personal financial budgets on time? If they're indecisive about little things, how can they operate a business?" Stay engaged. Discovery Days overflow with information, and franchise executives will be watching to see whether you're paying attention. "But the events can be pretty draining, and we understand the human part of it, too," says Joe Lindenmayer, president and COO of TSS Photography. "Everybody deserves a couple of passes. We once had a man who dozed off during a PowerPoint presentation and we still invited him to join our team." Be honest. If you're weighing this franchise option against another one, say so. Says Colabuono, "If you can't be honest during Discovery, will you be honest as a franchisee?" To make the best use of a Discovery Day, try to determine whether you'll fit into the system's culture. "Be sure you know what they're looking for," Sturgis says. "Ask if you have the background and skill set of their successful franchisees." In other words, are you like the other people attending Discovery Day? In today's economy, that may be a tough call, because fewer people are qualifying for franchise loans and making it to Discovery Days in the first place. Rosa Kelliher of Hanson, Mass., says she was looking forward to meeting other people in the same situation when she traveled to Georgia for a Meet the Team Day at TSS Photography. "But I was the only one," she says. "At first I was disappointed, but by the end of the day I was glad because I had one-on-one time with all the managers and had all my concerns met." The Summerses also were delighted to be the only ones attending Spring-Green's Join the Team Day, because Kathy had lots of questions. "I'm the marketing manager for a real estate agent and will keep my job," she says. "Bob's the one who was researching franchises and I didn't know that much about the company until we went there. He'd had corporate positions before and likes solving problems, so I wanted to be sure the business would be challenging enough for him." "Our visit to Plainfield cemented me on Spring-Green," Bob says. "Lawn care may not be the sexiest thing in the world, but I learned that it can be fun and profitable. Of course, I'll have to deal with my own lawn first or none of the people in our neighborhood will be my customers. I'm thinking of putting a sign out there that says, 'Watch this space.'"